Almost 80% of American adults will suffer low back pain at some point. Interestingly, 70-80% of LBP is associated with musculoskeletal imbalances and improper core activation during everyday movement. Join us as we take a look at the latest research on the biomechanics of low back pain. From the hip to the foot, you will be surprised by how many different imbalances attribute to low back pain. This course helps you learn how to alleviate and prevent low back pain from the foot up through t he kinetic chain. Demonstrate the important role the fitness professional plays in educating, rehabilitating and enhancing function in clients with low back pain. Describe the lumbopelvic hip complex and identify the local and global stabilizers of this region. 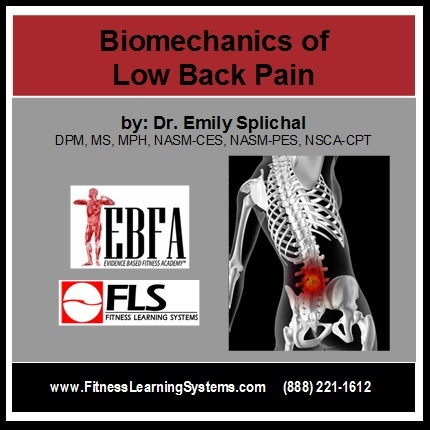 Understand the biomechanical link between lower extremity kinematics and spine function. Identify how foot dysfunction can cause low back pain and how to effectively improve foot function to correct low back pain. Explain how hip and pelvis dysfunction can lead to foot dysfunction and understand how to correct this hip imbalance therefore correcting the foot mechanics. Identify how limb length discrepancy can cause sacroiliac joint pain and whether it is functional or structural limb length discrepancy. Assess if delayed activation of the gluteus maximus is a contributing factor to sacroiliac joint pain and if so, learn how to re-activate the gluteus maximus. Create an evidence-based lumbar stabilization program that starts from the foot and extends up the kinetic chain.